Why hasn't this been a thing all along I ask? Out of natural common sense with all the waste one household creates; with all the plastic piling up in the ocean and rivers killing animals; and more importantly the "over crowding" of streets and neighborhood - I feel this is a thing that should of been adopted and enforced a long time ago when the production of waste and materials were going through their "boom".... But hey! I'm just a bottom dweller on the food chain so who's going to listen to me? Having a circular economy means eliminating the concept of waste and realizing everything has a value. In short, quick, and simple terms: RECYCLE! Any and everything does have some capacity to be recycled and reused - anything that is and truth be told that these big corporations and companies know... it can save money and reduce waste. Instead of making landfills into trash mountains you can reuse and reuse and reuse something that took 5 dollars to make and it save you 30 extra dollars you would have spent in replacing that same 5 dollar item six different times you re-purchased it (small scale ratio but expand that into multi-million dollar things - get it? got it? good!) We can move the idea into effectiveness and out of efficiency that we have based everything on - quicker simple the better (NO NO NO) something a little work and effort can make a big difference (sounds like a quote that someone great said- but it's true! If we center every business around this idea and get people, businesses and consumers to accept this idea - by 2030 it is a 4.5 trillion reward! Now tell me you don't want a piece of that pie! Of course we have to change the way we think and everybody stop being so driven by profits and gains but I think these companies that pollute the air and then have to send trillions to fix oil spills can spend that same trillion and turn it into something that is actually good for all invested. 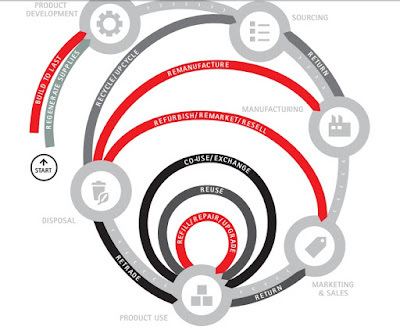 From the book "Waste to Wealth" by Accenture; "...the transition to a circular economy may be the biggest revolution and opportunity for how we organize production and consumption in our global economy in 250 years. Powered by advances in digital, it represents a huge opportunity for companies to create a circular advantage." My interest is peaked to read more about this topic and find our two things - how can it be done and how can I get in? Things will not and cannot be done unless we do this as a team and do it all together because they all go hand in hand. One place cannot be successful without the other helping the process along. This is great for everyone involved. Can't we see this a mile away or are we truly that blind? 1. Circular Supply Chain - if a company needs products that are hard to find or destructive to the environment they have to pay a much higher price to get it and to use it. Products used should be renewable, recyclable, and biodegradable. It forces them to think about what they use and the life it lives long after it have left the production line. MAKE THEM ACCOUNTABLE! 2. Recovery and Recycling - have existing companies that know how to recycle and reuse the products that are needed to be re-made in some shape or form to live another life. 3. Product-Life Extension - Just because something is old or outdated as marketing and advertising on TV leads you to believe; it's not true. Your item or product may work just fine. You will stopped being hoaxed into the "new and improved" instead "how can we fix it and give it new life" Relationships and refurbishments will be the business. 5. Product as a Service - Make retailers and manufactures bore the price of ownership! That would be something right? performance will outlive volume. companies will create new opportunities to build relationships with their consumers to keep them treating the product "nicely" You agree? Things like this are possible. It's not just an idea anymore. Start-ups are running the world and making it a new place to thrive in. People are making use of what they have and how to save it without spending a breaking the bank to get what you need and what you want. It's not such a far fetch idea that it cannot be. Look at Uber. It's now a household name that we are coming more familiar with day in and day out. It's possible- Would you agree? As always we are here to open your eyes and conserve a little money too!